There’s only one use for this bizarre ‘Swamp Thing’ style miniature that I can think of. A pumpkin head horror, part natural spirit, part animated vegetation stalking the inhabitants of an 18th Century American Colonial hamlet. Angry at the loss of his ancestral lands under the plough he’s picking off individuals at dusk as they attend to their crops or hunt game in the woods. The local Native Americans know all about him of course but the Colonialists think he’s a wild superstition concocted by the Natives to divert blame for their murderous activities against the settlers. The idea could easily be extended out to a fantasy wargame using Pumpkin Head as a GM controlled monster stirred into action upon the PC’s units entering a particular area of woodland etc. This entry was posted in Post-1990 and tagged Colonial Gothic, Ral Partha on March 29, 2015 by Hobgoblin Orange. I’ve always loved the concept of the Beastman. Historically it’s been a part of mankind’s mythology since prehistory of course and as a result features in many fantasy game settings. Runequest Broo are the earliest gaming interpretation that I know of but I’m sure there were others prior to that, especially if creatures like the ‘Pig Faced Orcs’ from early D&D are included as contenders. 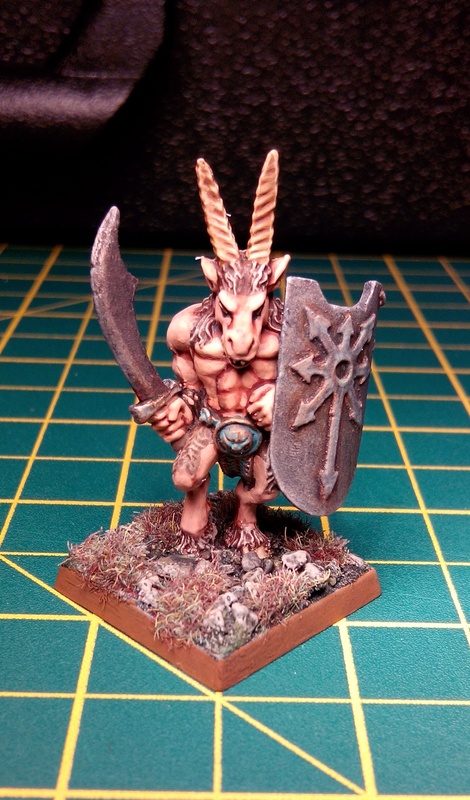 What I’ve not been so keen on since returning to gaming is reading about the division of GW Beastmen into the whole ‘Gor’ thing – Bestigor, Ungor, Bray, etc purely based on horns. Now I’m pretty sure this all started in the ‘Lost and the Damned’ book back in 1990 but it just doesn’t fit with me. I don’t understand all that regimented separation based solely on horns in a chaotic transient warband of animalistic killers. Anyway, here’s a GW Beastman from the mid 90s recently purchased off eBay. I’ve painted it up with a cut down chaos warrior shield as it didn’t come with it’s original. 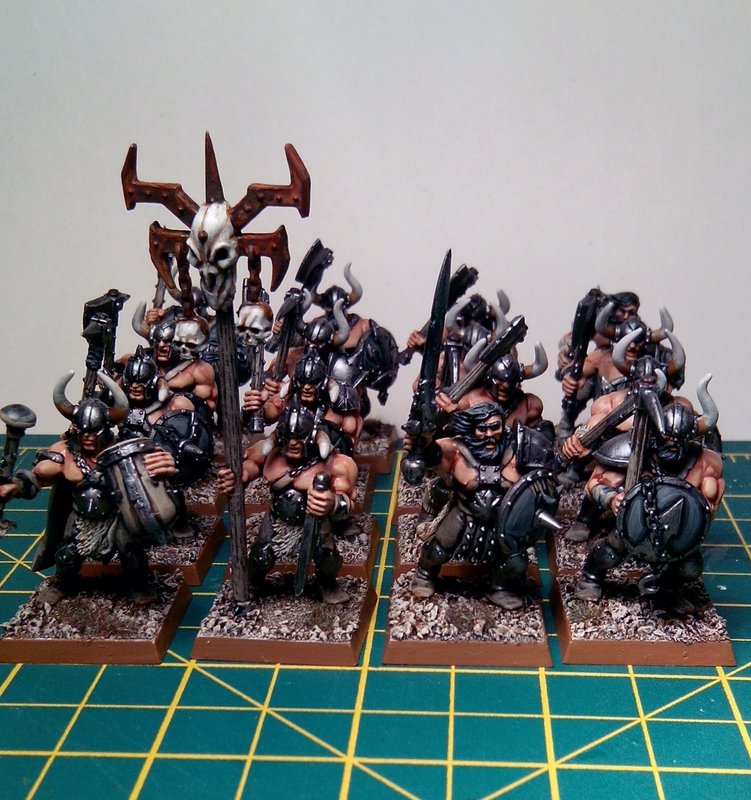 This entry was posted in Post-1990 and tagged Beastman, Broo, Games Workshop, Runequest on March 19, 2015 by Hobgoblin Orange. This little figure is full of character and makes for a great vertically challenged magic user/scholar/monk type figure. Perhaps the biggest plus with this miniature is that despite his lack of height he hasn’t been sculpted with a beard which frees him of the ‘fantasy dwarf wizard’ label that could easily have been thrust upon him if he’d had one, leaving him much more of an versatile model for different genres. This entry was posted in Post-1990 and tagged Joseph the Wanderer, Scibor on March 17, 2015 by Hobgoblin Orange. These GW marauders are part of the small generic evil/chaotic warband I’m slowly painting up. Horned helmets are of course headgear de rigueur for fantasy barbarians everywhere and also the historically incorrect debonair Viking about someone else’s town on the pillage. I’ve always liked the look of the keratin embellished hardhat despite the fact that any warriors wearing them would surely suffer broken necks or have them knocked off their heads pretty quickly in a fight. 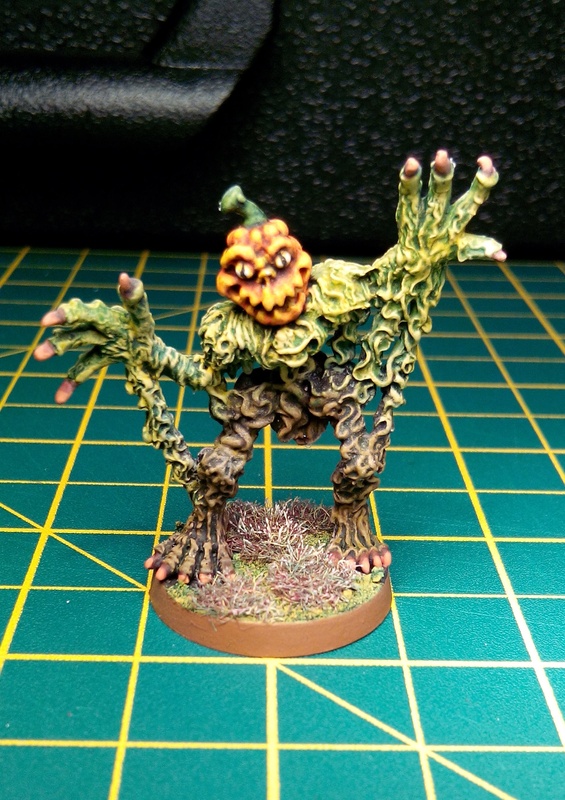 This entry was posted in Post-1990 and tagged Chaos Marauders, Games Workshop on March 13, 2015 by Hobgoblin Orange. Recently I’ve been searching for cheaper options than Games Workshop’s command miniatures for a small fantasy generic evil/chaotic force I’m assembling. The figure of Anval Thricedamned caught my eye whilst searching through Reaper’s Bones range as a suitably imposing champion. Reminiscent of Carl Critchlow’s Thrud the Barbarian – muscular to the extreme but with a miniscule head – he also put me in mind of the mutation ‘Pinhead’ from the D1000 chaos attribute chart in the ‘Slaves to Darkness’ book. To be honest I wasn’t particularly taken with the original tiny head on Anval. The detail on it seemed pretty poor so I decided to swap it for a spare head from GW’s Warriors of Chaos box. 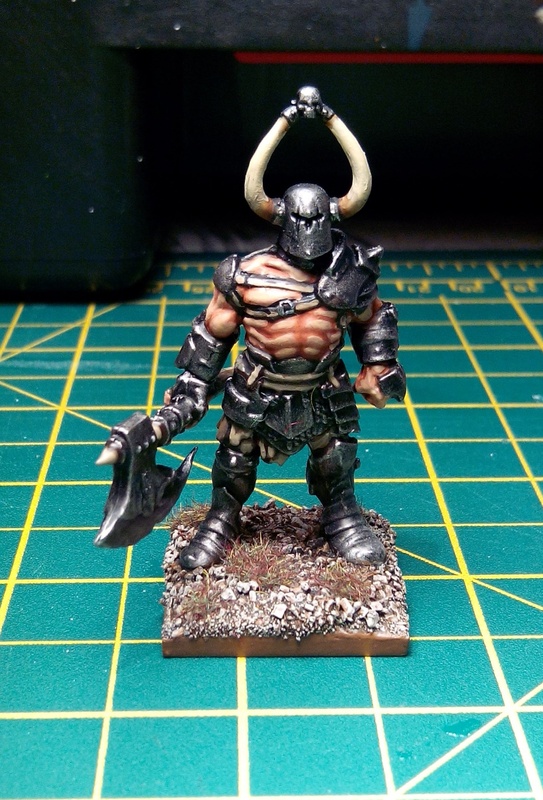 Whilst the soft plastic of Bones Miniatures might make face detail less defined in comparison to harder plastics it does have the advantage of making basic conversions like this very quick and easy to accomplish. This entry was posted in Post-1990 and tagged Carl Critchlow, Reaper, Thrud the Barbarian on March 10, 2015 by Hobgoblin Orange. Entitled ‘Sinessa – Hellborn Sorceress’ this Reaper Bones miniature looks to me like many of the female magic users Tony Ackland drew in the early 80s. From memory a fair few of those illustrations graced the pages of the first edition of Warhammer Fantasy Battles (the pale green box with the 3 black books). I envisage mine as a Dark Elf or Chaotic Sorceress of some type. I particularly like the cloven feet – a nice touch by sculpter Bob Ridolfi. 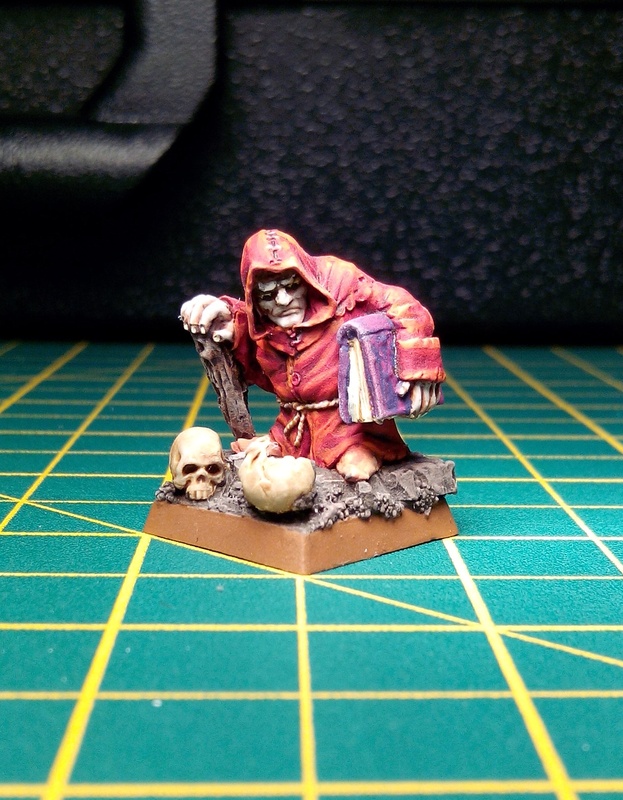 This entry was posted in Post-1990 and tagged Bob Ridolfi, Reaper, Sorceress, Tony Ackland on March 9, 2015 by Hobgoblin Orange. I didn’t play much AD&D as a youngster (although I did try to get a game of Labyrinth Lord together a few years back but to no avail) so Mind Flayers (or Bathalians as Reaper call them) don’t really mean a great deal to me. That said I do like the idea of a tentacled magic user so here’s a Reaper’s Bones Bathalian. 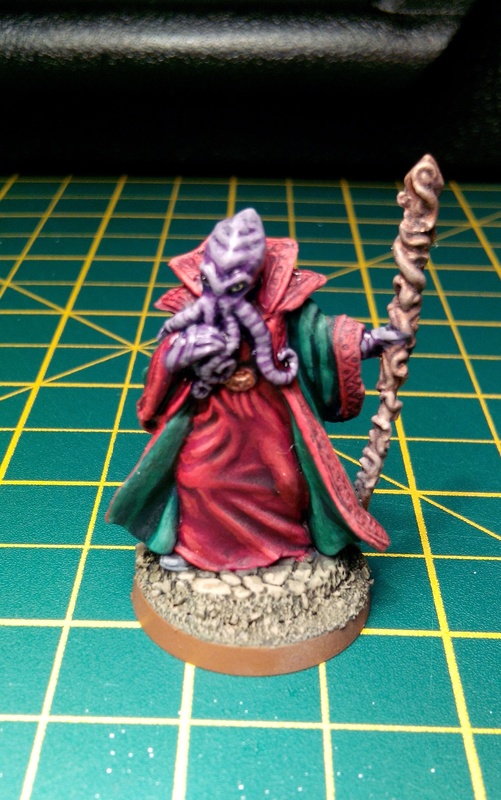 Although I probably don’t intend to use this particular model because of the purple skin I do want to get another one to use in a planned Cthulhu Cult alongside GW Genestealers, Wargames Factory Shock Troopers and some Wargames Foundry WW2 German NCOs I’ve purchased. This entry was posted in Post-1990 and tagged Bathalian, Mind Flayer, Reaper on March 6, 2015 by Hobgoblin Orange.